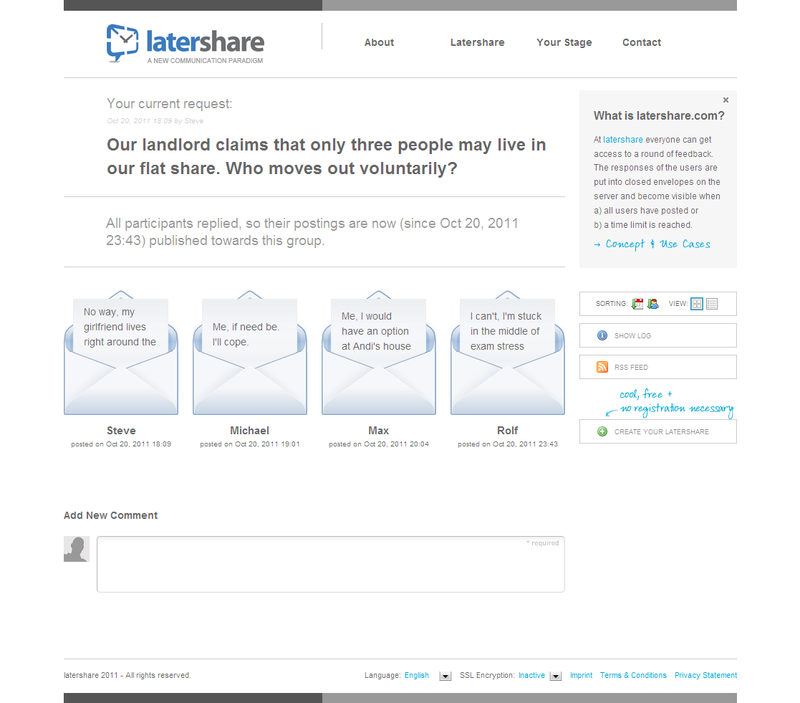 With latershare, the official beta version of a new and innovative communications platform goes online on October 25, 2011. latershare is a simple, secure, and useful online tool to publish the replies from rounds of feedback not immediately but on a time-delayed basis. Who goes first in a "You first!" - "No, you!" situation? How do you avoid the influence of the first reply on later comments? Anyone can arrange for a round of feedback on latershare, without registering and at no charge, and in just a few minutes. The answers of invited users are stored on a server in closed virtual envelopes. The contents are not visible until either all users have posted or when a time limit has been reached. The replies are only displayed to a defined user group and to all participants simultaneously. latershare is the first online-service that in this way insures all participants have identical information at a certain point in time. Since all the criteria for a decision are laid on the table in one fell swoop, not piece by piece, latershare also makes it easier to find a common solution. they publish content immediately, and communication takes place sequentially in dialogue form. What is missing here is a medium for independent, parallel communication and time-delayed publication. Reserve ("You first!" - "No, you!" situations): latershare is especially well-suited for finding a solution when no one wants to be the first to answer so as not to diminish their position. Influence: How do you avoid the influence of the first reply on what is said later? latershare solves the problem of email distribution lists, forums, and meetings in which the first replies can influence the remaining participants and thus the result. Originality: How do you recognize what is an original opinion and what is a copy? How can you be sure that everyone prepares for a meeting? With asynchronous input and synchronous output, a wide range of communications situations can be improved. The possible areas of use range from voting and cost estimates to pitches and games, even to providing an overview of opinions or preparing decisions. Individuals can publish announcements or decision outcomes with a time delay. latershare can also gather bids, continue stories, or arrange compromises. "Many things were previously cumbersome because this type of communication was lacking," says Jens Hoppe, founder of the platform, entrepreneur, and communications researcher from Munich, Germany. 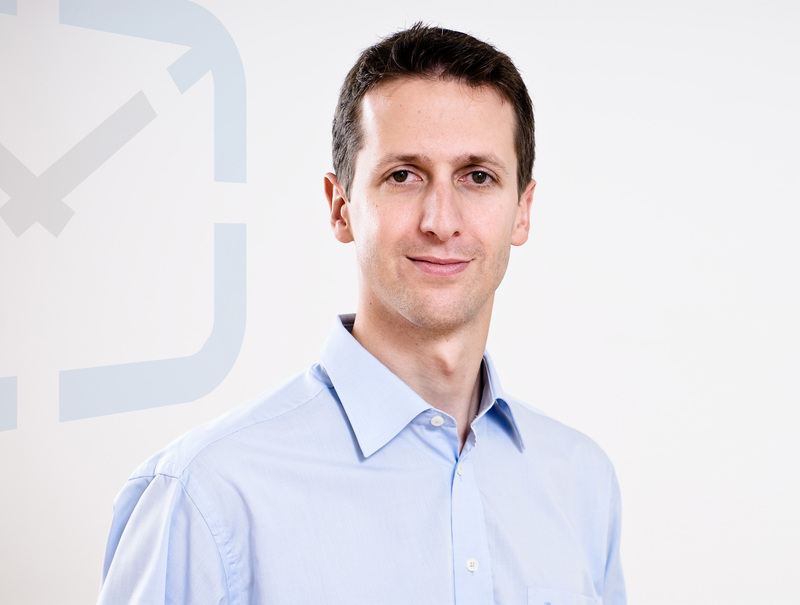 He expects this new web service to establish itself slowly but surely. "People are quite accustomed to dialogue-based, sequential communication, such as in discussions, meetings, email, or chats. At the same time, this is not exactly efficient or expedient for a large number of situations, even somewhat counterproductive. We want fewer emails and meetings, and more originality and fairness." The idea is simple, but the scope requires explanation. The concept and its advantages are explained in detail on the latershare website, along with the features of the platform. "latershare also means you can give the matter some time, remove influence and bias, and achieve better results." latershare's service is free of charge for individuals and companies. In a future phase, there will be a cost-based package of additional features for companies. Even a server version for internal company use is considered. 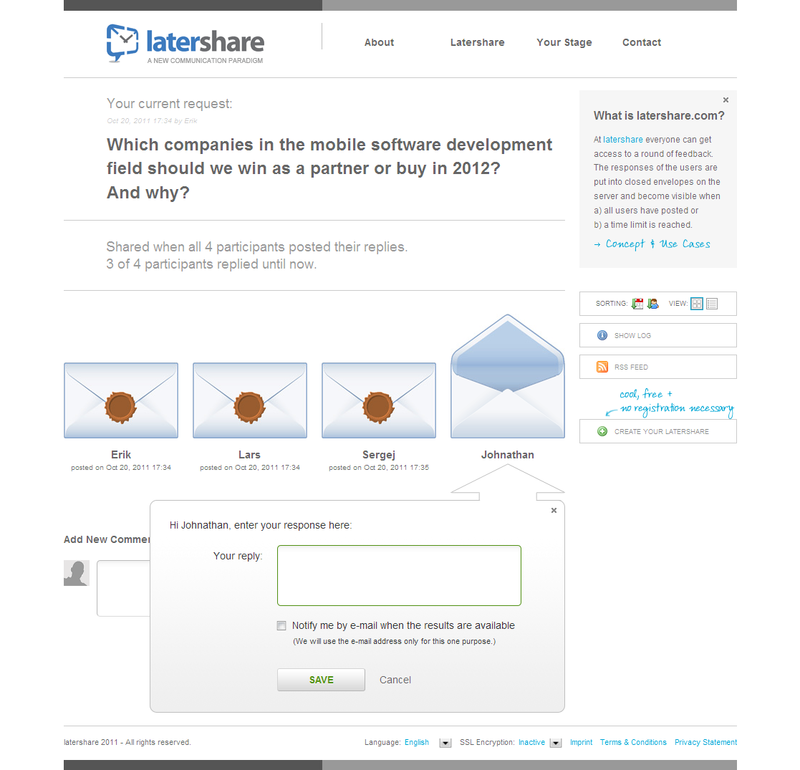 latershare was developed and is operated by the company latershare.com/Jens Hoppe as a multilingual internet platform. latershare's goal is to enhance interpersonal communication and make certain communications situations more efficient. latershare places great emphasis on usability, openness, universal applicability, and respect for privacy. The service does not require registration or software installation and is used around the world in business environments as well as private. latershare.com is a pioneer in this new type of time-delayed publication and parallel, independent communication.